Chile’s Nick Yunis heads the field after Day 1 of the $25,000 buy-in High Roller event of the PokerStars Caribbean Adventure (PCA) on Paradise Island. The Norway-based Yunis holds 407,100 chips for a 61,400 lead over American venture capitalist Bill Perkins, who will start Day 2 at the Atlantis Resort and Casino with 345,700. What is all the more incredible is Yunis – who lives in Bergen – was among seven re-entries on the opening day of the event after he busted out early in a 15-hour day. Yunis will definitely be hoping to improve on his best ever cash, which arrived in September last year with his fourth place finish for $47,763 in a €3,000 No-Limit Hold’em event in Cannes on the Partouche Poker Tour (PPT). Eleven levels of play were completed, with 56 players surviving from the 141-strong field, although there were seven re-entries – including Yunis, Joe Elpayaa, Eui Woong Kim, Chance Kornuth, Chris Moorman and Triple Crown winner Bertrand ‘ElkY Grospellier – to take the prize pool to a huge $3,626,000. 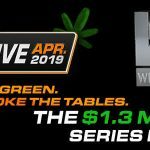 A total of 16 players will make the money, with the minimum payout being $58,020, the winner taking home a Shamballa bracelet and $1,134,930, and anyone who makes the eight-strong final guaranteed at least $108,780. Yunis and Perkins are followed by California’s Taylor Paur (317,100) in third, Ohio’s Keven Stammen (301,500), Chris Hunichen (271,000), of North Carolina, Norwegian Terje Augdal (270,000), Canadian Mike ‘Timex’ McDonald (267,500), New York State’s Andrew Lichtenberger (248,000), a second Canadian in Team PokerStars Pro Jonathan Duhamel (226,300) and New Yorker Elio Fox (216,800). What a rollercoaster ride of day enjoyed by Yunis, though, as he battled back from busting out within the opening four levels to claim the chip lead come close of play. 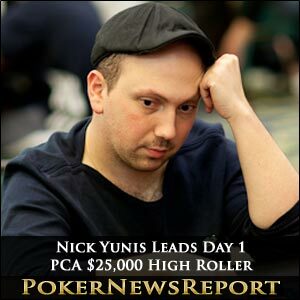 Once he had re-entered, however, Yunis moved swiftly up the leaderboard, taking down a crucial pot against Pennsylvania’s Carlos Boyd to assist in his ascension. Boyd had gone all-in on a board of 8♦ 2♦ 10♣ 5♠, but, while Yunis had him covered, he still took some time to make the call with the A♠ 8♠. The American showed Kd-5d for a diamond flush draw, but the river was no help to Boyd and that was him eliminated. But it was Houston multimillionaire businessman Perkins who emerged as the day’s star as the amateur showed great aggression to take part in many more pots than most. The Texan certainly showed no fear as he continually got all his chips into the middle – and quickly saw his stack climb to the 345,700 he ended the day with. The seemingly ever-cheerful Perkins also notched up some notable scalps during his rise, including sending the likes of Swedish online poker specialist and Team PokerStars Pro Viktor ‘Isildur1’ Blom – who had won the $100,000 buy-in Super High Roller event just five days ago – to the rail. He also eliminated Ecuador-born and Spanish-based Carlos Mortensen, a two-time World Series of Poker (WSOP) bracelet winner, and Frenchman Ludovic Lacay, who secured his biggest pay day of $500,557 with a 16th place finish at the 2009 WSOP $10,000 buy-in main event. Meanwhile, Quebec’s Duhamel – the WSOP main event champion from 2010 – emerged as the frontrunner among Team PokerStars Pros as he ended the opening day of the High Roller in ninth spot. The 24-year-old has enjoyed a very profitable PCA so far, having won the $5,000 buy-in No-Limit 8-Max side event two days ago for $239,830 after finishing fourth behind winner Blom in the $100,000 buy-in Super High Roller tournament last Saturday for $313,600. Duhamel did, in fact, score a vital pot when seeing off fellow Team PokerStars Pro Eugene Katchalov. In that hand, the Canadian opened with 1,300, only for New York-based Ukrainian Katchalov, who was immediately to his left, to three-bet, resulting in all other players getting out of the way. Now back on Duhamel, he made the call to see a flop of J♠ 8♠ 4♥. He then checked and Katchalov popped in a 2,500 bet, only for Duhamel to check-raise to 7,700. Katchalov made the call to see the 7♣ on the turn. Duhamel then led out with a 13,700 bet and Katchalov called. The K♥ arrived on the river to complete the board and Duhamel again led out with a 28,400 bet. Katchalov gave his decision some thought before calling. But Duhamel showed the 6♠ 5♠ for an eight-high straight and Katchalov mucked hit hole cards. Katchalov did, however, survive to make Day 2 in 40th place on 72,500 chips, as did fellow Team PokerStars Pros Ville Wahlbeck (in 23rd place with 128,600), 2009 WSOP main event winner Joe Cada (31st with 91,400), Barry Greenstein (28th with 100,000) and Pierre Neuville (18th with 150,700). Team PokerStars Online player Randy ‘nanonoko’ Lew (66,000) and PokerStars SportsStar Gualter Salles (112,000) – who is a Brazilian racecar driver – also remained in contention. However, among those to crash out on the opening day was last year’s winner Will Molson, who cannot now make a fourth straight heads-up clash in this event. The Canadian – who has made $1,622,925 from his three successive top two finishes in the High Roller, including $1,072,850 for last year’s victory when defeating Argentina’s Leo Fernandez heads-up – hit the rail during the evening’s final level. The Montreal native was joined by an impressive list of casualties, including Team PokerStars Pros Vanessa Rousso, Fernandez, Liv Boeree, Vanessa Selbst, Daniel Negreanu, Blom, Jason Mercier and Pius Heinz. Also hitting the rail earlier than they would have hoped were the likes of Elpayaa and Kornuth (both twice), Carlos Mortensen, Erik Cajelais, Ryan Julius, Matt Jarvis, Justin ‘Boosted J’ Smith, Moorman, Matt Waxman, Max Lykov, David Sands, Matt Glantz, Olivier Busquet, Christian Harder, Michael Mizrachi, Josh Arieh, Shannon Shorr, Sean Getzwiller and Tom Marchese.